That’s right, Bears fans. The team will be without their top FOUR linebackers going into the game. 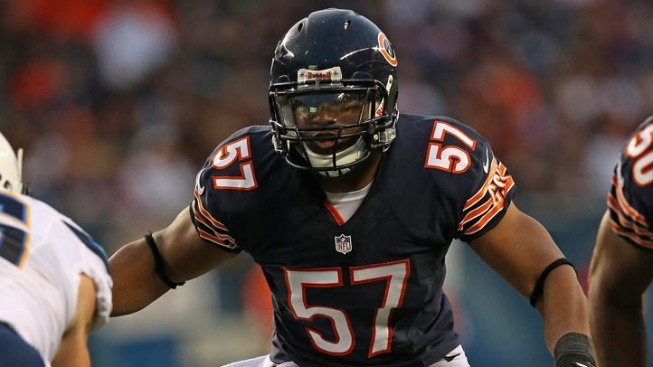 In their place, the Bears will be starting Khaseem Greene, Darryl Sharpton, and Christian Jones at the position. Terrell Manning was also activated from the practice squad, but even with that motley crew, the Bears look like they could be in deep trouble. About the only thing going for them in this area is that the Falcons aren’t exactly blessed at tight end. Against the Carolina Panthers last week, linebacker injuries and ineffectiveness allowed Greg Olsen to shine, and with Tony Gonzalez retired, the Falcons will be looking for production out of guys who aren’t exactly proven. In other news, the Bears will also be without CB Sherrick McManis, S Ahmad Dixon, and LT Jermon Bushrod for the game. Starting center Roberto Garza will be back on the field for the Bears however, making his first start since suffering a high ankle sprain in the Week 1 loss to the Buffalo Bills. Safety Chris Conte (concussion) and defensive tackle Jeremiah Ratliff (concussion) will also be back in the lineup for the game.